What a triumph this one turned out to be. There is something quite amazing about the taste of dill. It takes me back to the mediterranean and especially Turkey where I ate amazing dished swathed with the stuff. 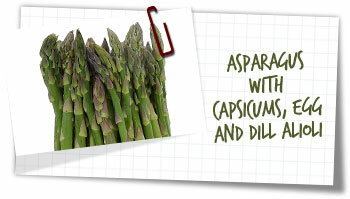 This Spanish inspired salad used asparagus which has a delicate but distinctive taste, the creamy alioli dill mayonnaise is a great match and the addition of the egg makes for an unusual but essential ingredient. Both work perfectly with the sweet and slightly smoky red capsicum. It’s truly inspired! Cook the red capsicum in a 200ºC oven for 25 minutes until soft and slightly charred. Put straight into a plastic bag for 5 minutes. Remove from the bag, slip off the skin then remove the stalk and seeds. Chop the flesh into large chunks and set aside. Blanch the asparagus in a pan of boiling water for 3-5 minutes (depending how thick they are) they should be slightly soft but with some bite. Drain and leave in cold water. Whisk briefly the egg yolk, crushed garlic, mustard, vinegar and lemon juice. Add a tablespoon of the olive oil and whisk for 30 seconds, then in a light stream, add and whisk constantly the remaining olive oil. The mixture should emulsify and form a thick mayonnaise. Stir in the dill and some freshly ground black pepper and set aside. Arrange half the capsicum in one layer on a large plate arrange the asparagus over then sprinkle over the remaining capsicum and chopped egg. Spoon 4-5 tablespoons of the mayonnaise over the salad then sprinkle with the parsley. Serve alongside anything really. We ate it with a BBQ chicken and garlic roasted mushrooms. Ribeye steak with polenta, mushroom ragu, charred radicchio and slow roasted tomato. © 2019 cookeatblog.com. Powered by WordPress. Deadline Responsive by AWESEM.